Congratulations to our brand new teacher of the week, Mrs. Lenox from Pecatonica Middle School. 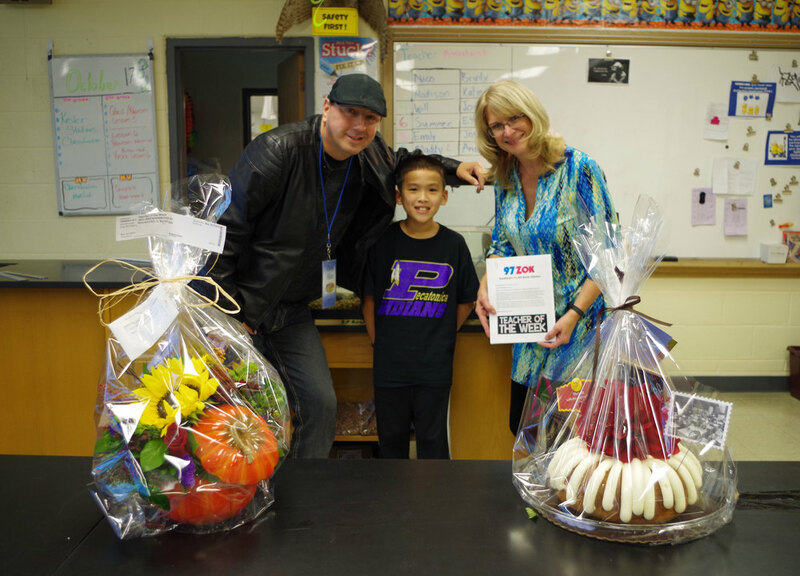 Mrs. Lenox won flowers from Broadway Florist, a cake from Nothing Bundt Cakes and a gift certificate from Oriental Trading Company. The nomination came in from Zayne Hoffman. Zayne says: Mrs. Lenox is my 6th grade Science teacher at Pecatonica Middle School. I am nominating her for Teacher of the Week because she is always happy and excited to see her students when we walk into her classroom. She loves to play science games and do many fun science experiments with us. I happen to have a learning disability. She is always understanding when I struggle in class. She tells me to stay positive and not get frustrated.Mrs. Lenox teaches in a way that I can understand and feel more confident in my work since being in her class this year. I have learned from Mrs. Lenox that it is ok to learn differently, it makes me unique. I always look forward to her class as I know I can be who I am. Mrs. Lenox is passionate about teaching, therefore it makes me passionate about learning when I’m in her class.